I am trapped in Mountain Pass - Teleport does not work in this location. PLEASE READ BEFORE REPLYING - MY STATUS MAY DIFFER FROM THE NORM. By the way, I played KOTC all the way through years ago - I don't recall having nearly this much difficulty getting out of Mountain Pass. 1) While on the "first level" of Mountain Pass, I fell though a trap door and into a fight with a bunch of gnolls. I landed in sand or something, and was immediately hit with an insect plague. A fairly major battle occurred. The party began the battle in the south part of the room, up against a wall to the south, with the floor area bright yellow (I believe indicating sand, which slows movement). 2) I won the gnoll battle, and completely cleared the level. 3) I DID NOT ENCOUNTER A DRAGON ANYWHERE IN MOUNTAIN PASS. Searching for the answer, I found people referring to the room where the dragon and his followers were fought. However, I did not find any dragon in Mountain Pass. A) I entered Mountain Pass without having completed some key achievement. B) The game is bugged, allowing me to paint myself into a corner, which I did. 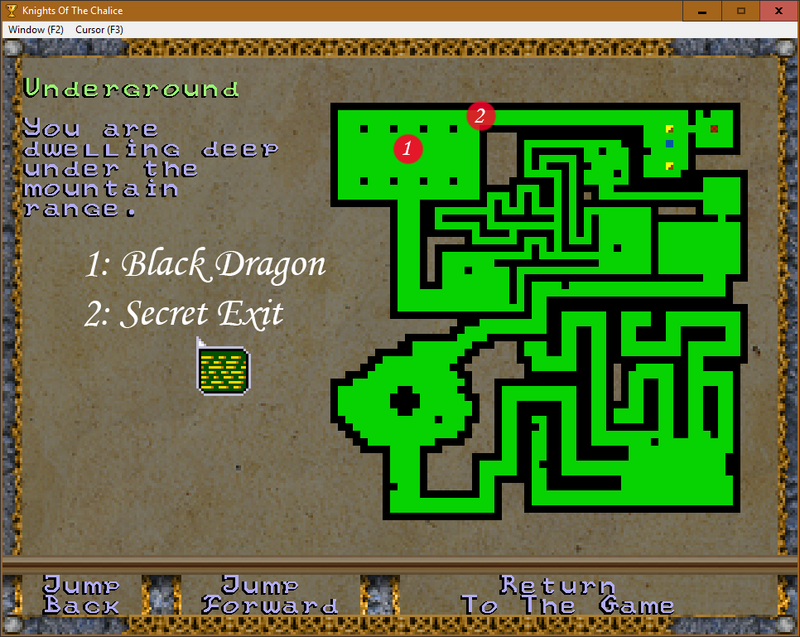 In other words, the dragon and exits are not there because I failed to do something before going to Mountain Pass, and the game did not take this into consideration - you just get trapped in Mountain Pass. In Corinth, the Witch keeps telling me that she hopes I can find and free the villagers (obviously, before I went to Mountain Pass). When I played previously, I thought I freed all the villagers (and the Witch began to sell me stuff) before I ever went to Mountain Pass. However, I may be misremembering. I looked and looked for more villagers to free. I have gone all through the Orc Stockade several times. I did fight a green dragon there (and freed his prisoners). After hours of looking for more villagers to free (and finding none), I decided to go anywhere I could that would advance the quest. Some locations had force fields blocking me. However, I was able to get into Mountain Pass. Now, I wonder if I needed to free all the villagers before entering Mountain Pass. 1) Is it possible to free all villagers before going to Mountain Pass? Must I do so? Are they any place other than the Orc Stockade? I've gone through the stockade several times. Any ideas on where I may have missed some? 2) Can someone please describe EXACTLY how to exit Mountain Pass? And what room was the dragon there in? What color dragon? I didn't fight a dragon in Mountain Pass. I wonder whether that means my game is somehow corrupted (that I "should" have done something before going to Mountain Pass). The reason I say "EXACTLY" is that I think it's "broken" for me. That it won't work even if I go to, and click the right area. So, I want to be sure that I "did it right", and it didn't work. P.S. I'm playing what I call a "copper man" game. I am in "ironman" mode, but I back up the game files at major junctures. I decided that this was a good policy after my computer crashed during an ironman game. So, I can probably back up to before Mountain Pass, if I need to. If the Dragon is not here and you have not killed it already, maybe your saved game is corrupted. Still, please try to move close to the wall at point number 2, that's where the exit is and you need to walk along the wall to discover it. I feel like a dope. From playing years ago, I remembered the room where the party members all become blind if a rope is pulled. So, I "cleverly" avoided pulling the rope. I did not remember that pulling the rope also opened a secret door!